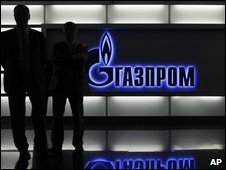 Russia's energy giant Gazprom has signed a $2.5bn (£1.53bn) deal with Nigeria's state operated NNPC, to invest in a new joint venture. Analysts say the move could further strengthen Russia's role in supplying natural gas to Europe. The agreement comes during a four-day African tour by Russian President Dmitry Medvedev. As well as forming Nigaz, Russia is keen on developing a trans-African pipeline to transport Nigerian gas to Europe. This could further reinforce Gazprom's already-strong influence over Europe's energy supplies. "Russia has a number of goals [in Africa], one of which would be to take part in a growing competition for resources and markets on the continent - mainly with China," said Yaroslav Lissovolik, head economist with Deutsche Bank in Moscow. Sergei Novikov, a spokesman for Rosatom, Russia's state-run civil nuclear energy agency, said the Nigaz deal would lay the foundations for building nuclear power reactors in Nigeria. Nigeria has previously said it would like to develop a nuclear power plant to address its energy shortages. Before visiting Nigeria, Mr Medvedev spent time in Egypt. He is also visiting Namibia and Angola - which are rich in natural resources - during his trip, as he seeks to promote Russian business interests. "Part of the agenda is to push Russia's credentials as a representative of commodity-rich developing countries with such forums as the G8 and the G20," said Ural Sib bank's chief strategist Chris Weafer in a note to investors. Russia is not alone in seeking to secure energy deals overseas with commodity-rich nations. Separately on Thursday, Chinese oil refiner Sinopec has made a $7.2bn bid to acquire oil exploration and producing firm Addax, which focuses on Africa and the Middle East. If the deal is approved by regulators it would be the biggest foreign takeover by a Chinese firm.